Using PGP can be quite hard, even if you have a lot of experience with computers. By the way encryption is what gives us privacy and permits us to safely transmit information and for this reason it should be easy to use, for everyone. Keybase really makes encryption easy to use. When Keybase was launched it was mainly a wrapper for PGP commands to encrypt and decrypt a message for a certain user, but it also introduced a very nice chain of trust. In Keybase it's possible to either generate a new PGP key or import an existing one but the most important thing is being able to verify our own identity using multiple proofs. Many of us have a personal blog, a Twitter or Facebook accounts, a GitHub account etc... All these accounts combined together make our online identity. Every Keybase account can be verified by other online identities. 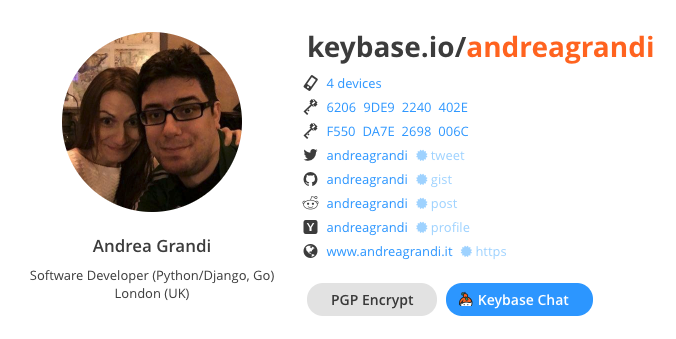 In Keybase you don't just say "I'm Andrea Grandi, this is my PGP key...". In Keybase you can link your existing online accounts to your Keybase account and show additional proofs of your identity. Unless an attacker controls all your social accounts, they cannot impersonate and verify themselves as if they were you. Once you are on Keybase, other users can look for you even using your GitHub or Twitter username without having to know your email address or Keybase username. This concept can be very useful in some situations, we will see it later. 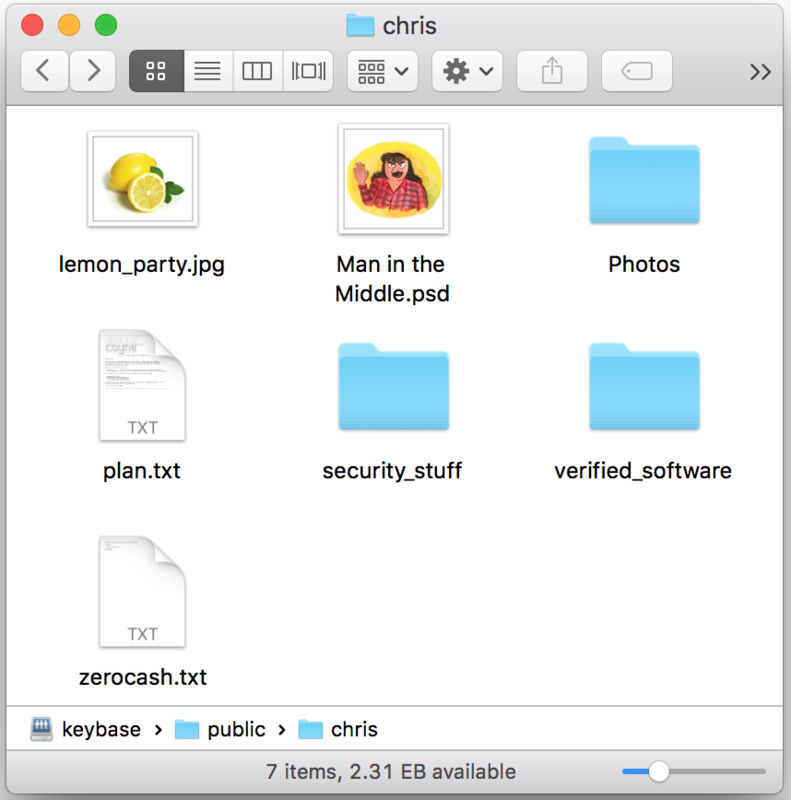 One of the first features launched by Keybase was their encrypted filesystem. There is a virtual folder located at /keybase (on OSX/Linux or k:\keybase on Windows) where you will find at least three other folders: public, private, team. Note: This is very useful if you only know a person on Twitter (or GitHub etc...) and you want to share a file with them (or send a message, as we will see later) but you don't follow each other and you can't reach them privately. You can put whatever you want in these folders: your public PGP key, your official avatar, your Signal fingerprint etc... the other users will access these files with the assurance they haven't been changed by anyone else in the middle. Note: please keep in mind that Keybase doesn't work like Dropbox or similar. Files are not synced between your devices and Keybase servers. Files are streamed on demand, so you won't be able to access these files without a working Internet connection. Hey but... where is the encryption here?! Whatever you put inside your private folder can only be read by you and only you. Not even Keybase employees can access the content of your files, because they are encrypted before leaving your devices and decrypted on demand when you want to access them. Do you want to share files with anotheruser? No problem. Just create a file inside /keybase/private/andreagrandi,anotheruser (the folder andreagrandi,anotheruser will implicitely exist already) and that file will only be readable by you and anotheruser. Keybase employes only have access to: 1) your top level folder names (like: "andreagrandi,anotheruser"), 2) when and for how long you are reading/writing, 3) how much space you are using. They won't be able to access the content of your files and not even the files or folders names. Every user initially had 10GB quota available, but a few hints (including one of their recent screenshots) say that now users have 250GB available to store their files. 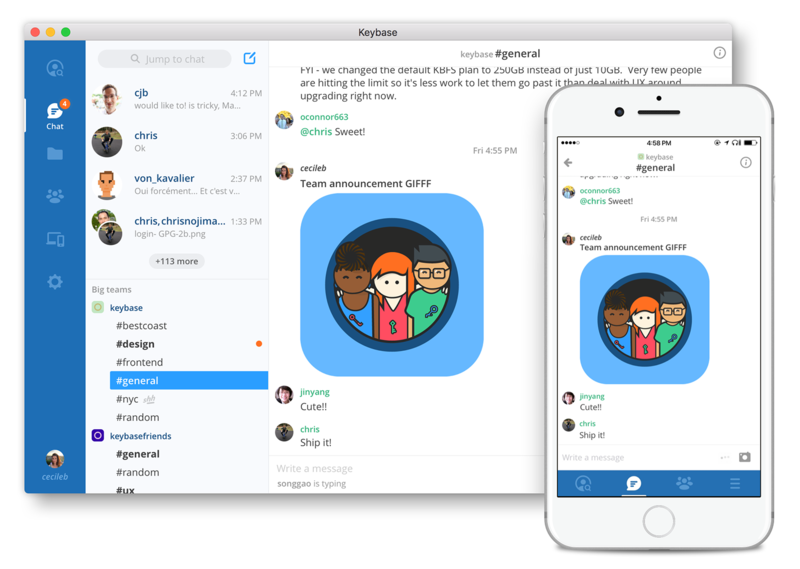 A few months ago Keybase introduced the encrypted chat. Messages between users are end to end encrypted and cannot be read by anyone else, not even having access to Keybase servers. When we use services like WhatsApp or Signal, we are forced to share our telephone number if we want the other person to be able to contact us. You can even send a message to a person who is not on Keybase yet: if you send a message to [email protected], when randomuser joins Keybase and verify their Twitter account, the message will be encrypted for them and will be safely delivered. 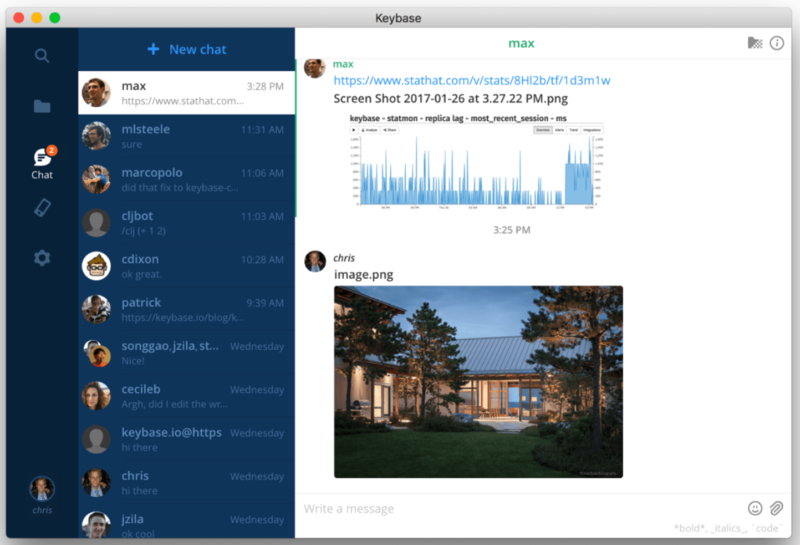 Keybase doesn't use PGP to encrypt chat or files. Transmitting the key across all devices wouldn't be safe so each message is encrypted using the public key of every device connected to the account. keybase chat send andreagrandi "Hello mate!" Keybase has recently introduced Teams feature. The Chat becomes more similar to Slack, but with the difference that only team members can read the content of messages and files: the server only knows about team names and users, nobody else can access the content. Sometimes we have the need to store private information in a safe way and we want to be sure that nobody else is able to access these information. 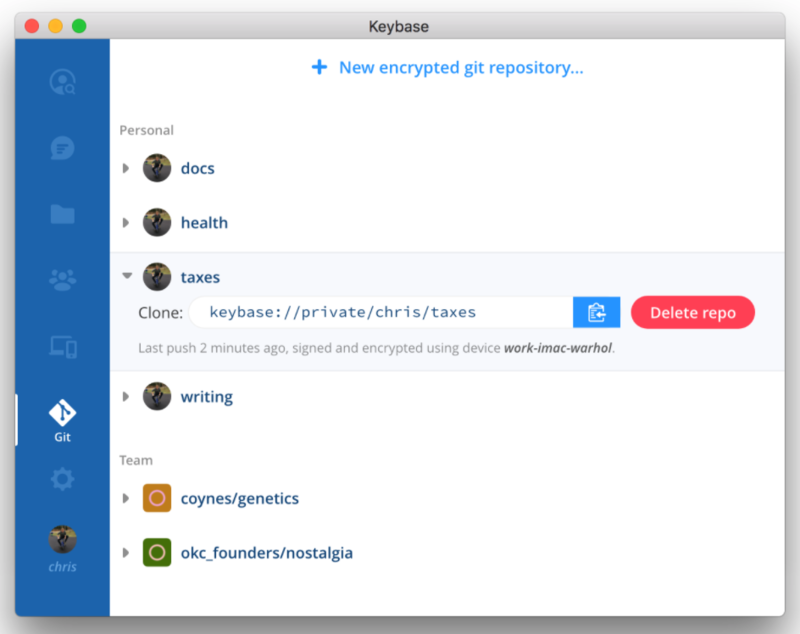 Latest feature that has been added to Keybase is encrypted Git repositories. They are like normal GitHub repositories, but their content is stored in a safer way. What is the difference with GitHub private repositories? In GitHub a private repository is used to store information that only our account can access, but the files are accessible in plain text by GitHub employees. With encrypted Git repositories instead, the information are encrypted before they leave our device and they are stored encrypted. Nobody, without having our private key can read them, not even Keybase employees. Encrypted Git repositories are of course available for teams too. Creating a team repository, it will be available to all the members of the team. Both teams and single users have 100GB of space available (which is separate from Folders quota). and I can use it as a normal git repository. Every time I commit and push something, the content will be signed and encrypted and only available to the repository owner (which is me) or to the whole team if it's a team repository. Keybase is still in continuous development but it already offers a few interesting features which can help people in their every day life. I strongly advise anyone to get an account, play with the available features and report any bug so the developers will be able to fix them and build an even better product. I can't wait to see the features they will announce in the next months! If you use docker.io (or any similar service) to build your Docker containers, it may be possible that, once the new image is generated, you want your Docker host to automatically pull it and restart the container. Docker.io gives you the possibility to set a web hook after a successful build. Basically it does a POST on a defined URL and send some informations in JSON format. docker-puller listens to these web hooks and can be configured to run a particular script, given a specific hook. It's a very simple service I wrote using Python/Flask. It's also my first Flask application, so if you want to improve it, feel free to send me a pull request on GitHub. Note: this is not the only existing service that is able to do this task. I took inspiration from this article http://nathanleclaire.com/blog/2014/08/17/automagical-deploys-from-docker-hub/ and I really tried to customize https://github.com/cpuguy83/dockerhub-webhook-listener for my own needs, but the problem is that dockerhub-webhook-listener is not ready to be used as is (you have to customize it) and I'm not very good with Golang (yet) to be able to do it in little time. This is why I rewrote the service in Python (that is my daily language). I want to thank Brian Goff for the idea and all the people in #docker @ FreeNode for the support. Once configured, I suggest you to setup a Nginx entry (instructions not covered here) that for example redirect yourhost.com/dockerpuller to localhost:8000 (I would advise to enable SSL too, or people could be able to sniff your token). The service can be started with: "python app.py" (or you can setup a Supervisor script). Every time docker.io finishes building and pushing your image to the docker registry, it will POST on that URL. docker-puller will catch the POST, check for a valid token, get the hook name and will execute the relative script. That's all! I hope this very simple service can be useful to other people and once again, if you want to improve it, I will be glad to accept your pull requests on GitHub. 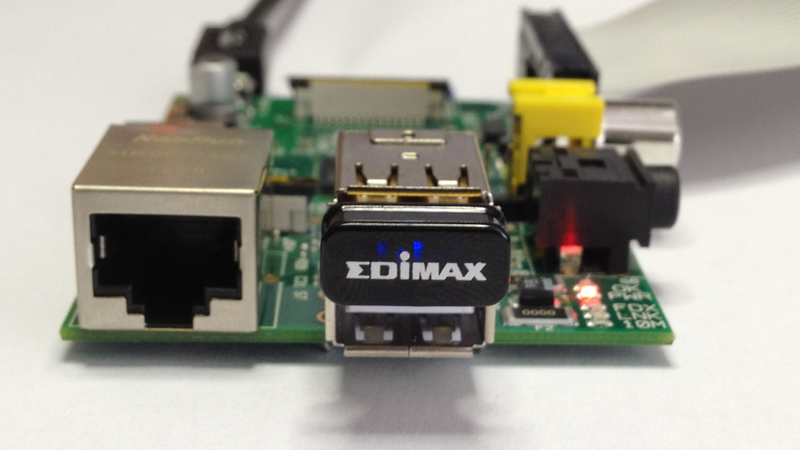 If you want to connect your RaspberryPi to your home network and you want to avoid cables, I suggest you to use the Edimax wifi adapter. This device is quite cheap (around £8 on Amazon) and it's very easy to configure on Raspbian (I assume you are using a recent version of Raspbian. I'm using the one released on 20/06/2014). where 192.168.0.1 is the IP of your router (of course substitute this value with the ip of your router). I created a further script to keep my WIFI alive. This script will ping the router (change the IP using the one of your router) every 5 minutes and if the ping fails it brings down the wlan0 interface, the kernel module for the wifi and bring them up again. The configuration is done. Just reboot your RaspberryPi and enjoy your wifi connection.